Abakas: Did I Find a Bug? Interesting; when looking at your post on your site, with Firefox 3 on Mac, I see "Doesn't Work" rendered normally in all three cases. Reading through Bloglines, the first two examples are rendered blank! I'm not sure what bug you thought you found, but something funny sure is going on. Looking in Safari on Mac, you're right... and it gets even weirder. I'll update with screenshots. Ahh... I can tell you what's going on, and it's not that illegal content is being stripped. 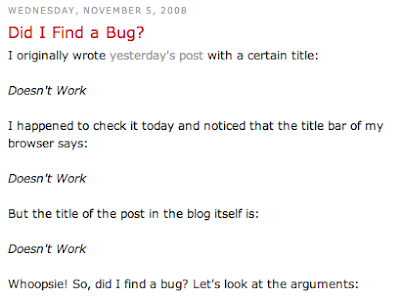 Whether or not it's a bug is a good question. First, let's look at this post. You, as author, are allowed to use any HTML that you want. HTML is extensible and forwards-compatible, so anything in < and > is a tag. When you wrote "<Feature>" that went into your post, and the web browser sees that during rendering, says "I don't know how to render that, so I'll ignore it," and it seemingly doesn't render. If you want to include those in HTML, you need to use "&lt;" and "&gt;". The second issue is more of a potential bug; why does the title show up correctly in your window title, but not on the post? I explained why it renders wrong on the post above. But for the window title, that's what Blogger has put into the <TITLE> tag for the page. HTML mark-up isn't valid or processed there, so it shows the contents verbatim! Yes... the issue is that it's treating the text as a tag. Given that I was using their rich text editor, I would think it should have converted for me, though. All in all a fairly simple bug, really, and one with a pretty easy workaround! But still not the friendliest thing. Agreed; the rich text editor ought to perform any escaping necessary to be WYSIWYG.